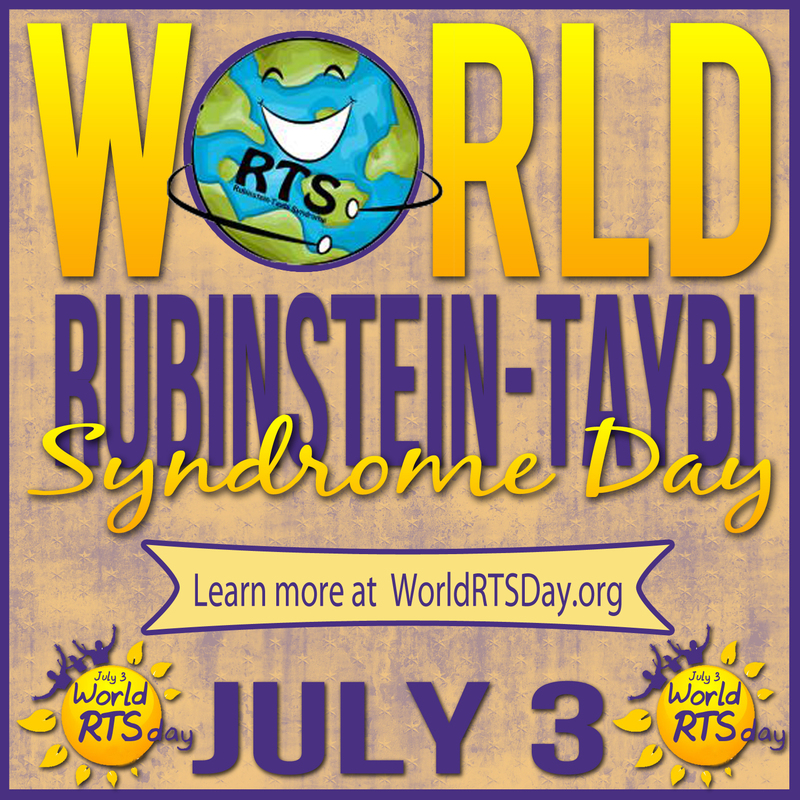 We are getting ready to celebrate our 2nd World Rubinstein-Taybi Syndrome Day since finding our diagnosis. We have learned so much in the past year and made many great connections with families who have children with RTS. This year (and every year) we hope that our story reaches many to help raise awareness. Rubinstein-Taybi Syndrome is still a rare syndrome that not many have heard of, including many medical professionals. The more people who our posts reach, the more people who have at least heard of RTS and can look up information to possibly help others. Rubinstein-Taybi Syndrome (RTS) is a rare syndrome that affects 1 in 100,000 to 300,000 births and is usually the result of a random gene mutation in the CREBBP gene. The mutation is usually “de novo,” meaning no one in the family was a carrier. If an individual with RTS goes on to have children, the chances of their child having RTS are 50%. For families who have one child with RTS, the chance of having another child with the same syndrome is less than 1%. RTS is characterized by distinct facial features, broad thumbs and broad first toes, short stature, and mild to moderate intellectual disability. One of the hallmark characteristics for individuals with RTS is their smile. Individuals with RTS have a smile that is very distinct and causes the individuals eyes to slant down and almost close completely. Some reports call it more of a “grimace,” but any parent will tell you this smile can light up the world. As with any syndrome, there is a spectrum and how RTS affects the body varies from person to person. Some have severe medical issues and others have more mild issues. For most, it can affect the brain, heart, digestive system, and respiratory system. Many of the children need a feeding tube in early years, but learn to eat by mouth and eventually have the tube removed. (Some do still require the tube for many years). Some children have severe apnea and use a tracheal tube, and some have moderate apnea that is easily managed. Many children have a severe speech delay that causes them to learn to speak late, if at all. Some children do not speak verbally, but they learn to use sign language or a communication device. Much of the available research is outdated, but it is a good base for understanding and learning about RTS. If you are recently diagnosed, I encourage you to reach out to other families who can give you a more current account of how RTS affects the child and family. Here is a video of several of the beautiful children who have Rubinstein-Taybi Syndrome. So, What does RTS means to us? * RTS is the warm hug Braxton gives when he wants you to know he cares. * RTS is the bright smile Braxton flashes when he sees you for the first time in the morning, when the water falls in bath, or just any time he is happy…which is often. * RTS is learning about medical terms you never knew existed. * RTS is teaching others about how this syndrome effects your child and just how rare it is. * RTS is the shriek and squeal when a favorite song comes on the radio or from a favorite toy. * RTS is the little dance that tells us Braxton is enjoying a toy. * RTS is a loud cry and a head shake to show discontent or defiance. * RTS is a hum for the sake of making noise, to say that an activity or food is enjoyable, or just a way to get your attention. * RTS is understanding that milestones will take longer than usual, but are sweeter than ever. * RTS is learning to be grateful for the small things. * RTS is changing diapers for longer than you ever anticipated. * RTS is learning dreams do not die with a diagnosis, they just change. And sometimes they are better than you ever imagined. * RTS is celebrating the differences that make your child a unique individual. * RTS is really hard some days. * RTS is waiting in the surgery center…AGAIN. * RTS is the hesitation you feel about putting your child under anesthesia because of complications. * RTS is the sigh of relief when surgery goes well and your child did not have complications as anticipated. * RTS is spinning around as fast as you can simply because it brings you joy. RTS can be a lot of things to many different people, but to us it is simply a part of Braxton. He is just like any other child his age in many ways. He doesn’t like to be told ‘no;’ if he has a toy it’s his; if he was playing with a toy and you took it, he’ll be mad because it’s his toy; when he wants something, he wants it 5 minutes ago; he is always on the move; he leaves a path of destruction behind him; he dumps toys on the floor with no intention of cleaning them; and he loves you unconditionally. RTS makes some things more difficult for him, but at the end of the day he is a regular kid who loves hard and brings joy to everyone he meets. Thank you for loving and supporting our family. Share our story and tell others about the joy he brings and how, despite his diagnosis, he is full of life and love. 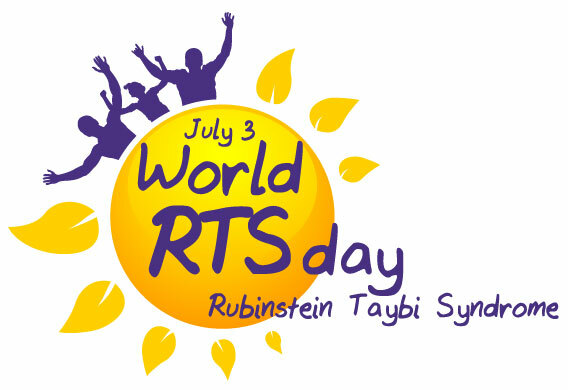 Feel free to use any of these photos to show your support for World Rubinstein-Taybi Syndrome Day! These photos and more can also be found in this Facebook Album. When I think that life is unbearable or unfair I think about Braxton’s defiant smile in the face of all his challenges. He lives fully and happily with an unwelcomed intruder inside his body. What can I say? He makes me realize how blessed and strong I am. Thank you, Braxton. The world is blessed to have you in it. I somehow cam across your and Braxton’s story. I can relate in so many ways as our oldest brother who is now 33 was diagnosed at birth with RTS. Everyday is surely a journey but we wouldn’t trade it for the world. Doctors said he would never walk or talk, well at age five he started doing both! Our family loves meeting and discussing RTS with the others around the country. Great story Braxton and wonderful smile!